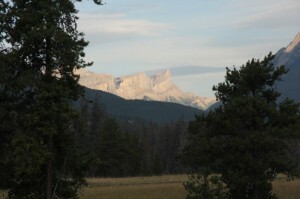 The mountains of Jasper National Park attract visitors from all around the world. In fact you will meet dozens of rental motorhomes in the mountains of Western Canada, mostly driven by Europeans. Recently Sylvia and I drove our motorhome from Ontario to British Columbia, and stayed a while in Jasper NP. We camped at a Jasper Campground and planned something different. 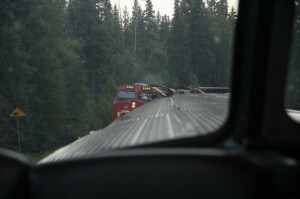 We decided to take a Via Train from Jasper to Vancouver. 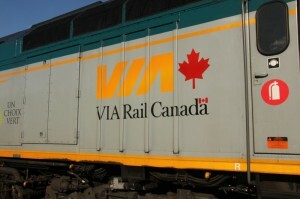 My wife has always wondered about taking the Via Train across Canada, and this was just a sample piece of such a long trip. 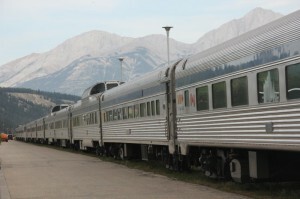 Visitors to Jasper remark on the presence of many trains. You don’t have to be a rail fan to appreciate some of the very long freight trains that pass through. They also take an interest in the beautiful passenger terminal. 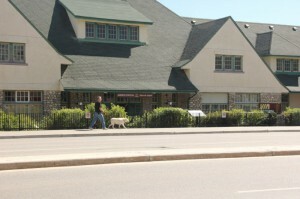 The Jasper Heritage Railway Station, built in 1926, is enhanced by the stone wall created from round rocks, possibly stream bed rocks. The roof is steeply slanted and broken up with dormers. The steepness should help reduce snow load in heavy snow winters. Inside the wooden interior you will find the information desk and rows of seats where you can wait for your train to arrive. There is the flutter of excitement when the long, sleek silver cars glide to a stop in front of the station. With the grey mountains as a backdrop, it’s a precursor of the quality of scenery yet to come. Soon the station has quietly dissolved into the distance and as we head west we are watching the green cloaked mountains rise rapidly from the railway until their snowcapped peaks stand starkly remote against a deep blue sky. Nearer to the edge of track white birch stands are mixed with the dark green evergreens of the forest. It’s nice to be able to watch the scenery for a change, and not the traffic while someone else does the driving. As we carve our way through the cuts in solid rock we hear the squeal of the wheels scrubbing on the rails on the curves. If you are lucky to get a seat in the dome car at the rear of the train you have a perfect view into the distance. 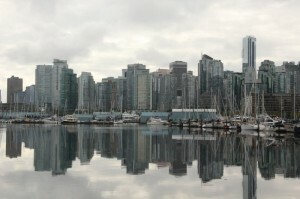 mountains were not close anymore and there was a long run into Vancouver showing back yards and industrial areas. It was a great trip, in spite of the Vancouver ending. Hope to do it again, someday, going the other way.